NEW YORK — Besides rushing to the mall this holiday season, a nationwide survey by Citi Retail Services (CRS) finds that consumers are increasingly shopping with their computers and mobile devices, or by interacting with their virtual assistants. In its third-annual study on evolving consumer holiday shopping trends, CRS found, after interviewing 1,000 U.S. adults, that while nearly three-fourths (73%) still plan on visiting a brick-and-mortar store to purchase holiday gifts, a sizable 57% additionally plan on turning to their computer to shop. In addition, 42% plan to shop using a their mobile device such as a smartphone or tablet, and 13% will turn to a virtual assistant, such as Alexa or Siri, to facilitate their holiday shopping needs. And the survey showed that while millennials are at the forefront of this shift in the holiday path to purchase, Gen Xers are right there with them. 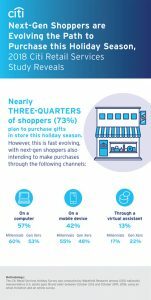 Sixty percent of millennials and 53% of Gen Xers plan on using their laptops or computer for their holiday shopping this year; 55% of millennials plan on using a mobile device, followed by 48% of Gen Xers. And when it comes to voice assistants, Gen Xers take the lead with 22% employing voice commands, surpassing millennials at 17%. And with smart speaker ownership poised to continue to increase dramatically (Adobe predicts that smart speaker ownership will rise to nearly half or 48% of U.S. consumers after the holiday season from 32% in August), voice-driven shopping behavior is likely to rise right along with it, providing retailers with a year-round opportunity to seamlessly connect with consumers and drive brand loyalty. Further, more than one-quarter of shoppers (26%) anticipate they will save $200 or more this holiday season, due to their rewards programs. And, again, millennials and Gen Xers lead the way with 33% and 28%, respectively, expecting to save $200 or more by leveraging rewards. And with retailers continuing to see strong enrollment in rewards programs (eight out of ten or 83% of consumers are currently enrolled in at least one rewards program, with one in four or 26% belonging to five or more), there’s an opportunity to engage consumers in these moments. In addition, the CRS research showed that consumers are keenly aware of which rewards programs they are enrolled in, with nearly nine out of ten (88%) – and 95% of millennials – confirming they are more loyal to stores where they are a rewards member. Among those who will buy gifts this holiday season, over a third (37%) plan on spending more than they did last year, and 69% plan to begin their holiday shopping before, or on, Black Friday. And while millennials and Gen Xers are getting a head start on their shopping (74% of millennials and 77% of Gen Xers are starting to shop before, or on, Black Friday), Boomers are largely doing the opposite with 40% waiting to start their shopping after Black Friday.